The M6 Plus is a unique dash cam made by the Chinese manufacturer DDPai. DDPai cameras appear to be popular in China and are starting to gain some popularity in Western countries. This dash cam is a bit different from other dash cams currently on the market. The camera is based on a HiSilicon Hi3516D processor and Omnivision OV4689 CMOS sensor. HiSilicon processors which have been traditionally found in security cameras but we are starting to see more dash cams with these processors now. This processor / CMOS combination allows for recording 1440p at 25fps, 1296p at 30fps or 1080p at 30 fps. Bit rate is approximately 10.5Mbps. Video quality during the day is very good and at night it is good. Most owners are quite pleased with the video quality from this camera. For night time, the video is brighter than many other dash cams but not as sharp as some other dash cams like the A119. The camera also has numerous unique features. The M6 Plus comes with a magnetic mount which allows for easy removal and attachment of the camera to the base (base is stuck to your window via 3M adhesive). A small remote button that you can attach to your key chain, is provided as well. When pressing the remote button, the dash cam will save a 10 second clip (5 seconds before the incident and 5 seconds after) and sends this video to your smartphone automatically via WiFi. The M6 Plus comes with time-lapse parking mode which records 1 fps while the car is parked. Hence it is constantly recording while parked unlike cameras with buffered motion detection parking mode. Note that parking draws the same amount of power as if the camera was operating normally. The camera also has WiFi, G-Sensor and built-in GPS. A CPL filter is optional. Build quality is quite good and the camera has a simplistic design with no screen and only 3 LEDs on the camera (Power = red, Recording = Green, GPS Receiver = Blue). There is a small reset button as well. Since the camera has no screen, setup must be done via the free mobile app (Android or iOS). Also note that the camera has Chinese voice prompts only which some owners may find annoying. Note that downloading the video clips via WiFi to your phone will save the files on the phone’s internal memory not on a phone’s SD card if available. The size of the camera is small at 64mm x 33mm x 65mm however it is not the most discreet camera. The brownish color, red ring around the lens and mounting mechanism, make it a bit more noticeable than the black shaped “wedge” cameras. One other item to note is that 250mAh Lithium battery instead of a capacitor. While this may not be ideal for hotter climates, the camera appears to have thermal protection which shuts down the camera in case it gets to hot. Also be aware there is no PC or OS X app to view the videos with GPS data (video can be viewed with a PC or OS X device but GPS data will not be included). Only the android or iOS apps can be used if you want to view videos with GPS data. 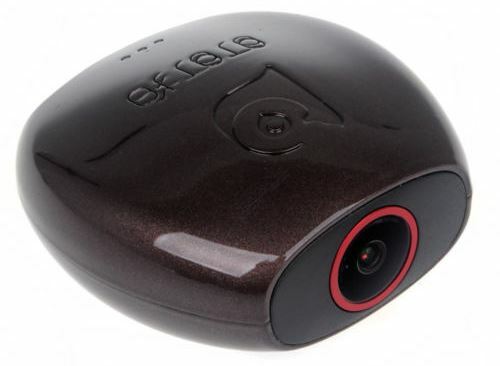 Some owners have indicated the camera vibrates and makes a noise when going over bumps. This appears to be due to the magnetic mount not being as secure as some fixed mount dash cams. The video demonstrates the problem. See what other owners have to say about the DDPai M6+ on our forum. The camera sells primarily on Amazon and eBay. Note that firmware can be updated automatically with the Android or iOS app for this camera.